I lead an innovative digital humanities project at a dynamic public history institution. In addition to public/nonprofit management, I excel at strategic communications in person, in print, and on the web. What is the future of the American past? I have developed a profound empathy for both the plaintive citizens bringing horrifying tales of death, crime, sexual violence, destitution, and starvation as well as for the representatives of government at all levels who are chronically unable to muster sufficient resources to address the systemic problems they saw. It is easy to see the Civil War as a crisis of elected government—at a legislative, gubernatorial, Congressional, and especially Presidential level—but I have come to appreciate the war as it drug down an underprepared and underpowered civil service under the weight of modern, total war. The antebellum systems buckled underneath the crisis. That book is far more complicated to write than a conventional political history and far less marketable than a new battle history. That book about the slow collapse of governmental systems under unforeseen external stress might also b far more relevant to a moment when the national coffers have been drained by years of military conflict and faith in the capacity of electoral politics to address the day-to-day issues facing the citizenry is critically low. Hiring good people isn’t just about creating positions within your organization. It’s about developing cooperative ecosystems that build better candidates while they’re still in graduate school. Working locally, you can build relationships that allow talented young people to attend regional universities and work with you. They come to the organization pre-invested in the mission of improving lives in their communities through history because they are from and of those communities. They give struggling regional history departments new energy and a corps of young alumni who are employed, productive, and ready to give back to their department in innumerable ways. Through their success, they prove to their departments that public history isn’t a backup plan but a specialized career that demands skills over and above those taught by conventional academics. Amanda L. Higgins and Patrick A. Lewis, “Investing in the Ecosystem” AASLH History News 73, no. 1 (Winter 2018): 7-10. As part of a planning grant from the Andrew W. Mellon Foundation and the National Historical Publications and Records Commission, the Nineteenth Century Digital Cooperative (NCDC) is exploring a sustainable system for the digital publication and discovery of historical records. This environmental survey of existing projects, methods, and data models is the first deliverable from NCDC for this 2018 planning year. While it was composed with an eye to the specific ends of this cooperative, NCDC hopes that it will be of use to digital humanists seeking to aggregate and link large historical datasets. You may access a PDF version of the NCDC Environmental Survey here. The mission of the NCDC is to create an aggregated body of named historical figures, with associated metadata and biographies—some well-known but most not—referenced in the corpuses of the member editions. Bringing together born-digital and print editions as well as making room for other digital or digitized biographical data sets which are not based in edited texts, the NCDC would enhance the power and reach of digital editions working on nineteenth century U.S. topics—both increasing the efficiency of editorial production and facilitating user access to the editions. Read more about the NCDC here. A contribution to Nursing Clio on troubled Civil War veteran and CWGK find Robert Buffum. How did the specific trauma of his wartime experience, namely being a prisoner of war, clash tragically with the institutional solutions his society had to postwar mental health problems? Read the full post on Nursing Clio. Use Buffum’s story in your classroom or community forum through CWGK documents and discussion materials. Recording of a July 2017 talk at KHS on the postwar struggles of Medal of Honor winner Lt. Robert Buffum. Buffum’s story of mental health problems, substance abuse, domestic trouble, and suicide echoes the struggles that many veterans face today. 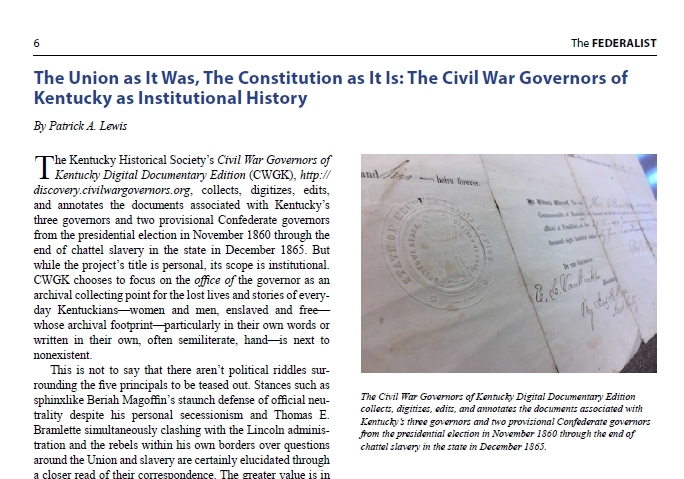 CWGK has developed an online exhibit and document reader suitable for the classroom and community group discussions. Link here. I am honored to have been included in a stellar group of editors and scholars on the Papers of Abraham Lincoln Review and Planning Team. The PAL assembled the team to advise on next steps as PAL, one of the most ambitious digital editions ever imagined, looks to convert over 15 years of editorial work into its first digital publications. Alan Lowe, executive director of the Abraham Lincoln Presidential Library and Museum, said the new team has worked on similar projects and will assist with the current staff to help publish these documents onto the museum’s website. Interested in digital history startup on your campus or at your institution? Here is some advice distilled from my experience leading CWGK, published at the excellent Society of Civil War Historians blog.